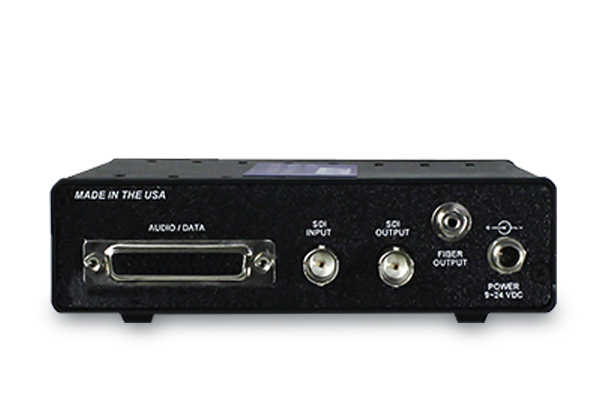 Multi–Rate High Definition Fiber-Optic Transport Link for Up to 1080p 3G HD–SDI. 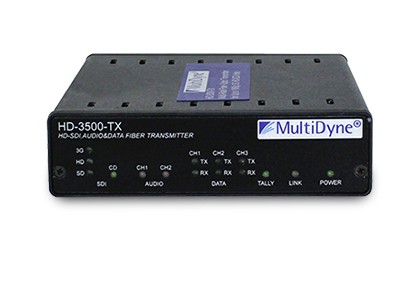 The HD–3500 provides a multi–rate high definition fiber optic transport link for up to 1080p 3G HD–SDI. The system also supports 2 channels of outbound digital AES Audio or 4 analog audio channels with 2 bidirectional auxiliary audio channels for 4 wire intercom. A separate 2 wire to 4 wire intercom bridge may be required. The HD–3500 also supports 2 bidirectional RS–232 or RS 422 data channels as well as 4 GPI and 1 tally. The HD–3500 is ideal for broadcast facility for moving high definition video as well as analog or digital audio intercom GPI and tally. The data and GPI channels can be used to control equipment in remote locations. The tally relay can be used to control a camera tally lights or the tally relay can be used for other types of control. The HD–3500 can also be used for remote camera control in the studio or for high definition surveillance cameras outdoors. The system is in use by NASA to broadcast space shuttle launches in high definition video where the data channels are used for pan tilt and zoom or PTZ control.